Dining at The Pier Hotel, Kaikoura, New Zealand. B&B accommodation, bar. Kaikoura, a South Island coastal seaport, has long been famous for its crayfish (lobster) fishery, and naturally this delicacy features largely in the cuisine of the area. 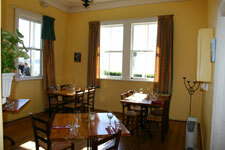 The Pier’s restaurant is rated one of the best seafood restaurants in the region. The Pier is also proud to offer an extensive wine list featuring local wines of distinction. “A must-do gastro bar when in Kaikoura” – U.K. Lonely Planet guide. The bar, with its historical photographs and cosy open fire, has been patronised for over a century by the coastal whaling and fishing fleets, giving it the authentic atmosphere you would expect in a country “local”.